Surin is a very chic neighbourhood visited by the jetset and is home to several five star spa resorts. Many also have a holiday home here or reside in awe-inspiring villas, with one end of the beach being known as 'Millionaire's Row' due to the number of expansive properties set up on the hillside with stunning views. The area has an understated elegance and retains much of its original tropical beauty and offers a perfect choice for a holiday in one of our luxury Surin villas. Surin is 15km north of lively Patong. 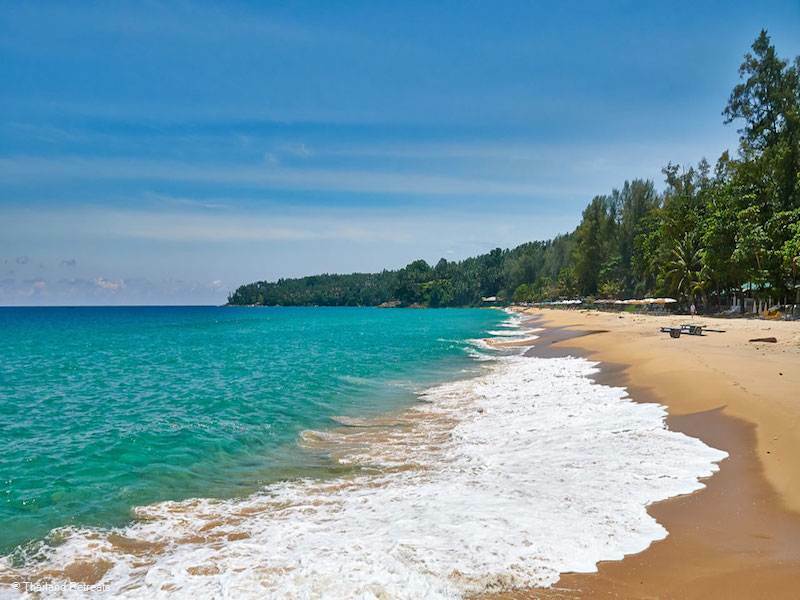 Surin beach itself is calm and relaxed, with a laid back vibe, an elegant haven to relax and rejuvenate. The main activity here is centred around enjoying the beach. You will find a spot to have a massage on the beach, swim or kayak. The beach is also popular with surfers. You can go for a walk and cover Surin on foot and it's quite easy to walk to neighbouring Bang Tao. There is plenty of space for visitors and tourists to enjoy the acquamarine sea and pad barefoot along the sand. It's uncrowded and easy to find your own area to relax. There are many restaurants and bars lining the beach and you can choose from all types of traditional and international food. The local authorities have recently cleaned up the beach, so that a few of the restaurants have been removed and pushed back to across the road and sun loungers removed. There is a lunchtime market featuring vendors selling tropical fruit shakes, spicy Thai salads and all sorts of delectable street food. There are a number of high end resorts in Surin including the Amanpuri, Twinpalms and The Surin. Many of these have spas, restaurants, bars and beach clubs open to non-residents. The beach is quiet and has a beautiful stretch of sand for you to pick a spot to relax. This beach is popular for surfing - especially at high tide and during August, September and October. The bay here can be dangerous for swimmers due to the nature of the tides, but is pleasant from December, January and February. It is not often shallow enough for small children to paddle. 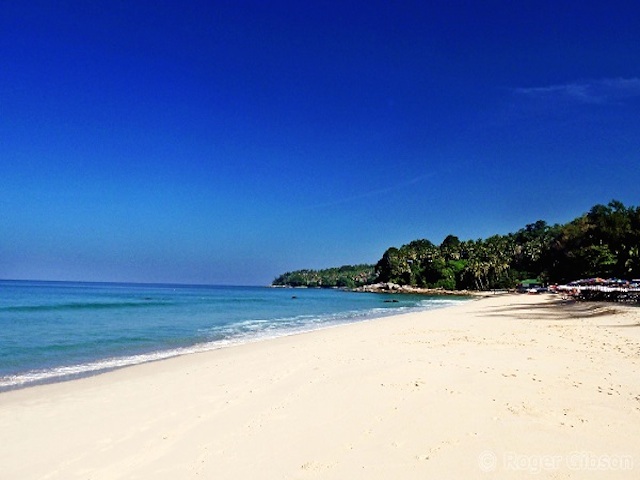 This is a beautiful beach mostly used by the residents of the Amanpuri or The Surin, but as no beaches in Thailand are private, you can access it via the sea or the hotel. This large beach has a fun and relaxed atmosphere and has beautiful sand and amazing clear blue water. In previous years the beach clubs that lined the beach tumbled on to the sand in the busy seasons had sun loungers 4 or 5 rows deep however under new laws ( this year) all illegal commercial outlets have now been relocated to the opposite side of the beach road leaving the beach clear of vendor outlets including sun loungers. 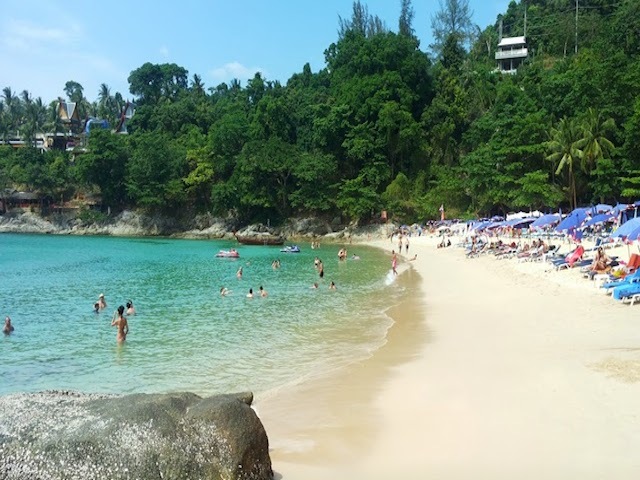 A beautiful sandy cove nestled just south of the headland before Surin beach and accessed down a pathway from the Kamala - Surin road .The beach can be busy in the high season with open air restaurants on the road running parallel with the beach road. Swimming is better at the south end whilst some snorkeling is possible at the north end of the beach. Taste serves fresh seafood, salads and steaks. Try the blackened tuna with wasabi alioli or grilled fish tacos with advocado and lime. The walls are adorned with fine art. A great spot to sip on a cocktail and watch the sun go down over Surin beach. International, Thai and seafood on the menu - try pan fried shrimp with green peppercorn, caper and chilli dressing. A beach club serving western and Thai food, signature dish is Khao Sai Gai (Chicken Chiang Mai noodles). Live sport is often shown here and there is a cocktail happy hour. A hip and contemporary restaurant that is part of the Twinpalms resort. A seperate grill and Thai menu and an extensive wine and champagne list. A lively beach club open all day from 10am to 11pm with signature cocktails and a range of beachside eats including salads, burgers, noodles and seafood. Live DJs are spinning the decks daily. The nightlife in Surin is quieter than Patong, partying is centred around the glamorous beach clubs. Many restaurants and bars are open until late for late night eating or a last drink or two. Located directly on Surin beach and even has its own plunge pool. Saturday evenings they have a live saxophone player. They describe their cuisine as fun Asian contemporary fusion. They have a children's menu. A stylish beach club serving food, but also open late for listening to live DJs and sipping one of the mixologists signature cocktails like the Surin Spice with Lemongrass, Cucumber, Chilli, Kaffir lime and Vodka. Dining here can be alfresco or in an air conditioned interior and chef Bruno Nicollini has a Michelin star in his Belgium restaurant.